Jet Jaguar vs. 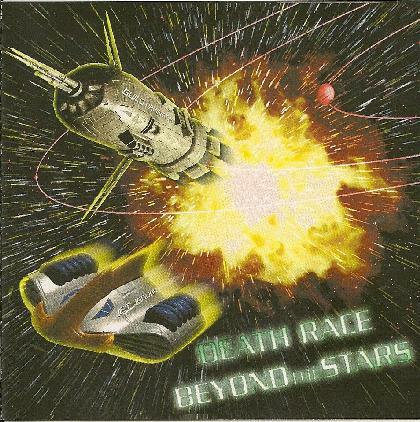 The Guild Navigators - "Deathrace Beyond the Stars"
Fasten your seatbelts kiddies because this deathrace is a duel between two of the contemporary space rock scene's most nuclear powered bands. We've got 6 songs from Albuquerque, New Mexico's Jet Jaguar and 6 from central Ohio based Guild Navigators. This is exactly what the promo sheet says: a no-rules, no-speeds barred, winner-take-all intergalactic Deathrace to Andromeda… and beyond! Jet Jaguar are up first, kicking things off with "Hot Wheels". This is trademark Jet Jaguar punky, Chrome infused, hot 'n heavy, industrial strength space rock 'n roll. The guitar chords are molten and we get some nifty soloing too. And all along the keys and synths soar. "Blackhole Killer" is similar but with a spaced out surf groove. The more laid back, keyboard dominated "Clones, Inc" still rocks but has a floating Hawkwind-ish quality. "Falling Towards the Sun" is a cover of a Guild Navigators song. After a slow buildup the band create a doomy space rock vibe, but this being Jet Jaguar things are spirited enough that the doom isn't so dark. The guitars blaze like an industrial chainsaw drone, the keyboard melody is like an old sci fi TV show theme, and the band alternates between fast paced space-punk and steady rock 'n roll. Absolutely outstanding. "Drivin' to Roswell" has got a super chunky rhythmic vibe, a bit of punk-metal, and old time high pitched 60s keyboards, which makes for a hell of a combination. Great song. And "Warp Out" is a new wavey, space rock instrumental that wraps up the Jet Jaguar portion of the set. The Guild Navigators start off with a growling voice calling the troops to arms and getting the spacecraft ready for the race against Jet Jaguar. Then they launch into "Andromeda Crashing", a metallic, punked out space-thrash tune. These guys are clearly determined to win the race. I think I've got whiplash from this one. "Nurse Onboard" is a bouncy rocker with constantly shifting rhythms and atmospheric space synths. Very cool and lots happening in just under 4 minutes. "Ghost of the Cosmonaut" is similar, with wild efx'd voices (must be the ghosts). Good song, kind of reminds me of early ST 37. The space-thrash is back on "Space Ark", which starts off with a high tension, totally spaced out intro bit, before launching into space rocking thrash. But it soon settles into a more rocking groove, though still played at a zillion mile an hour punk pace. But at nearly 8 minutes the Navigators take plenty of time to explore. We're treated to some cool ripping guitar soloing, a primordial stew of effects, and non-stop thrashing about, which is completely controlled, making this a killer slab of space-punk. The Guild Navigators give a nod back to their deathrace rivals with a cover of the Jet Jaguar song "She's An Alien". And a fine job they do, maintaining the spirit of the original, but injecting it with a distinct Guild Navigators identity. Dig that freaked out guitar! Finally, "Dream Jets Burning" begins as a bouncy new-wavish rocker, but then get more punky. Nothing particularly spacey here, but like "Nurse Onboard" they're continually changing directions, keeping the music always interesting and imaginative. The band briefly return to space for the Outro finale to a well played set. Wow, this is hands down the best stuff I've heard from The Guild Navigators yet. Note that Doug McMahan from Scattered Planets is on synths. For a split album these two bands couldn't have been better paired. RECOMMENDED!